Jon and Dan. Tomoko and Grant some days. So this is the report you have all been waiting for! I warn you now, it is enormously long, so you may want to check back at a later stage. So where to begin is the question?! First off I should say that Tokyo was awesome. We did have a fantastic time, but I’m sad to say there are some “buts” coming! I should mention that the reason we were able to go this summer was that we actually have a good friend who works for Disney in Florida normally, but had gotten a contract with Tokyo Disney Resort for eight months. He offered for us to go stay with him. This eliminated hotel costs, and actually made it somewhat affordable. Tokyo is MEGA expensive to get to and stay in, and so by having someone to stay with helped massively. 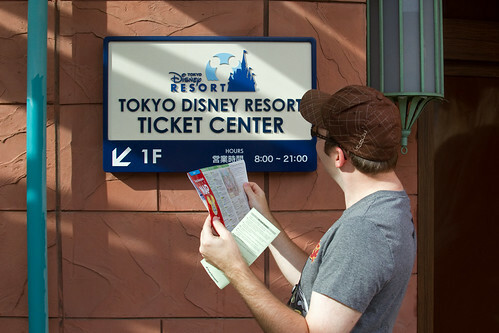 Tokyo Disney's ticketing is the first obstacle you have to endure when planning a trip. If you decide to go for a day, there is no hopper option, unlike Paris. One day, one park - or buy two tickets. If you decide to go for two days, you have to do one park on each day, and there is no hopping option. For three or four days, the first two days are the same as the two day tickets, one park on one day. The third and/or fourth days can be hopper days. To add to this confusion, you have to decide when you book what days you would like in each park. They do not sell more than four day tickets and for trips longer than that you need to buy more multiday tickets. All tickets bought must be used on pre-selected dates - you have to effectively book your days in the parks in advance, unlike the US or Paris where you can buy a ticket anytime for any day and just turn up. So, with two lots of four day tickets purchased, and all our days pre-selected, we were nearly all set to go. This was certainly shaping up to be quite the grand adventure! While in Tokyo we figured we would want to book one of the character dining experiences, but once again things to do with Tokyo Disney were complicated! 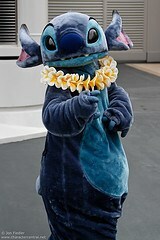 We could not book the Stitch dinner show because the reservations website was in Japanese only. 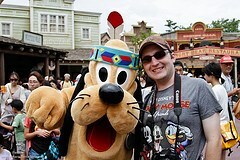 Fortunately our cast member friend has a Japanese friend who was able to book it for us. Let me state here and now, the Japanese people we met were very friendly, overall considerate, and tried to do whatever they could for you to help. We made a very good Japanese friend while there who is totally lovely. But, on saying that, the Japanese were also somewhat, how shall I put it? 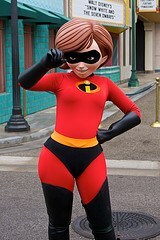 “Enthusiastic”, to say the least, about Disney. Jon and I were shocked. Completely shocked. We have honestly never seen lines anything like what they get in the Tokyo Parks. In the mornings, before parks opens, there will be HUGE lines at every gate waiting to get in. And I mean HUGE. The Japanese I am sure get there at 5am to start lining up. If you stand any chance of being in the park before 9am (which is its normal summer opening time), you need to be at the entrance a good hour before hand - probably longer. If you are too far back, it can take at least 20mins to get into the park. 20 minutes to get through the entrance! Once you eventually get through the turnstile, you have two choices. Run and hide or run. You can either choose to be “Japanese”, and sprint at Olympic speeds to every attraction to get those all important FastPasses, or sprint at Olympic speeds to just line up and be within the first 60mins of the line, or you can just run into a corner and hide from the insane rush of Japanese people who are fixed on getting to their first destination. It really is that mad. Not only that, once you get to the FastPass line, you will have to wait at least 15mins to get you FP. And when you get it, it will be for sometime after lunch, if not evening time. By the time you have got your FP, put it in your wallet, and recovered sufficiently from the mad dash to get it, the FP’s will probably be gone. Then you decide to go to some attractions… Attraction lines within an hour of park opening - before 9.30am - will be at least 120mins, and most likely at least 150mins plus. The Japanese are 200% completely and totally obsessed with anything Disney. The moment the parks open, they will tear the stores apart. Cast Members will be emptying new boxes of merchandise and filling the shelves, and the shelves will just be empty moments later. This leads me to my next point - merchandise. Merchandise at Tokyo Disney Resort (TDR) is overall fairly varied and different from the US and Paris parks. But, as with everything else in Japan, is exorbitantly priced beyond all reason. Small keychain plushes? Expect to pay around $30. Popcorn buckets? Expect to pay between $12 - $30. Apparently, as we found out, the Japanese are also obsessed by anything “small and cute”. Anything small therefore is a luxury item, and is ridiculously priced. Larger items tend not to be so much more, if not the same price, as the smaller items. The Japanese will also carry around all these items all day with them in the parks. And not just things they buy that day. They will bring with them from home a whole menagerie of stuffed animals, key chains, popcorn buckets, hats, bags - you name it, they bring it. They will carry it all around with them all day. It appears to be a fashion statement in Japan. You have to bear in mind, and I will mention at this point, this is in the summer, when in Japan it reaches over 100F/35C-plus temperatures and the humidity is over 90%. This is when even to walk is an effort in the blisteringly hot climate. And they will run with all this stuff attached to them, a hundred mile an hour to every attraction as soon as the park opens. Stuffed animals, popcorn buckets and everything else in tow in the 100 degree heat. It is not only unbelievably surreal, but just plain ridiculous. You would think at this point that maybe I am making this up. I can assure you I am not. Far from it. I only wish I was! It was a complete eye opener to see and experience. On top of all that, and despite their Olympic sprints at 8.30am, the Japanese could actually probably win, hands down, the award for the culture that “waits the longest”. With lines in excess of 200mins, you would think that would be enough. But the Japanese also wait outside in the intense summer heat for anything and everything. They will, literally no kidding, wait at least three hours for the day parade. They will sit there on their plastic mats with their popcorn buckets out in the heat and just wait. And wait. Japan for the most part runs on time. It is efficient consistent in most areas including opening hours and public transport. This comes through at the Disney Parks too, but at a cost. In the US and Paris, when you have a billed opening time, for the sake of convenience, easiness and all round good Guest service, most of the time you are allowed to enter the park early. Even if it's just half hour or so, you can at very least go onto Main Street to browse the shops. This not only provides immediate early morning sales for the parks (which makes good business sense - why have people stand and wait when they can shop? ), but also allows the entrance areas and walkways to be less congested and overall safer, and a nicer environment. The US and Paris Parks even have Extra Magic Hours (EMH), which allows Resort Guests and (in Paris), Annual Passholders into the Parks up to two hours early. Again, good business practice and Guest service, right? In Japan, nothing. In Japan if the opening time is billed at 8am, expect the park to open it's turnstiles at 8am sharp, and not a second before. 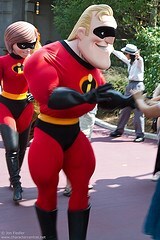 If you are a Resort Guest, you get a measly 15 minutes, yes you heard - FIFTEEN minutes extra in the parks. This is at a Resort where the lines to get in the parks in the mornings can be half a mile long (almost literally), and can take 20 minutes to get in the park once you're in line and the turnstiles open because of the sheer volume of people. This becomes very frustrating when you are standing in a MASSIVE line at 7.30am, and it is already baking hot, with 90% humidity. Their ridiculous rules don't stop there. The photography one is the one that REALLY bugged me. As you all know, Jon and I are avid photographers. We can't live without our cameras. 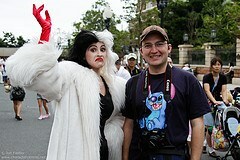 I have never, EVER known of a Disney Park to tell Guests to stop taking pictures. We aren't just talking in shows where the lighting is low here, we are talking in attraction lines and "normal" shows. We are talking "Dan takes a picture of a random rock in the line for a ride, and a Japanese Cast Member instantly appears practically demanding that I stop taking pictures immediately" - yes, it is that ridiculous. Theme parks are for people to rampage around with their friends and family having loads of fun and taking silly photos for their albums. 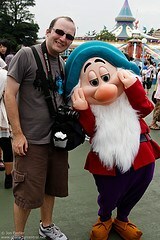 Theme parks are public places where you EXPECT people to take pictures - but not in Japan apparently. It is just outright annoying and plain stupid. I try to be fair when I am reporting on things for others to read, but I cannot escape my complete contempt for their utterly preposterous rules. If you do not want 50,000 members of the public all on vacation with their families taking photos of their fun times, then why build a theme park? "Ok folks as you board please keep your hands and legs inside the boat at all the times, watch your step as you enter and exit, and no standing at any time. And please watch your children. Enjoy your ride." Fair and simple, right? Now, in Tokyo that would be extended by about ten lines, and would include pretty much every rule and possible variable of circumstances that could arise from entering and sitting on a ride vehicle. The same goes for waiting for the parades. 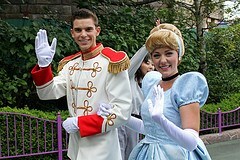 Cast Members will stand at the ropes, at about 15 feet intervals, and ramble constantly, from about an hour before the parade, to the moment the parade steps into their area. They will constantly tell you to move back (even if you're already six feet from the rope and sitting down), and will run around in sheer panic the moment the parade comes because they are terrified that people may accidentally, randomly fall into an oncoming performer or float (six feet away behind a rope). Yes, it really IS this ridiculous. Now we move onto the parade rules. The Japanese wait for HOURS for anything and everything. They will sit all day for the latest show. For the day parade, to get a good spot you can expect to wait at least an hour and a half. The interesting thing about how they organise Guests for the parades is that everyone has to sit. You cannot stand at any point. Now this isn't such a bad rule overall, but it takes up three times as much space to seat people than if they stood, and the park's walkways are already pretty crowded as it is. People will wait SO long for everything, that they even have a "plastic mats" rule. You can only save ground space with mats and blankets (or coats, or anything else) up to an hour before the parade or event starts. They actually make park wide announcements about it too! 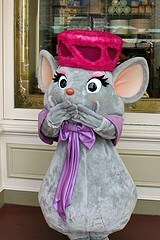 Never before in a Disney Park have I ever heard a Guest announcement informing me that I can now get out my plastic mat, as it is now an hour before the parade! And the Japanese will, too. The second it becomes an hour before the parade, out come the mats, coats, ponchos and blankets, and anything else that they can use to cover every square inch of floor space. The other problem with sitting is the height of the parades. Sitting does not bother me, but this is apparently the tried and tested method of doing things in Japan - so why are all the parade floats 50 feet high and the characters towering above the park? Who can see at that height? Who wants to crane their heads vertically for half an hour while the parade comes past? 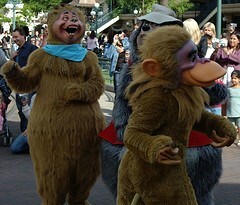 So why design the parade like this if it is the "normal" thing in Japan? Who knows. But it is annoying all the same! Now to something different. Duffy the Disney Bear Duffy is the cute stuffed bear owned by Mickey Mouse, made for him by Minnie. The story has it that Mickey was going on a long voyage, and was going to be lonely, so Minnie made him a travelling teddy bear. The bear came to life in Mickey's dreams while he was away, and would read Minnie's letters to him. A little weird, I know. For those of you who don't know, in reality Duffy is the bear created by Walt Disney World a number of years back to feature at their former Teddy Bear and Doll Weekends at Epcot. 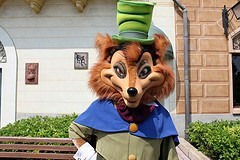 He became very popular with the Japanese, and so they decided to relaunch him at DisneySea with a new name (Duffy, of course) and new back story (the one I described above). 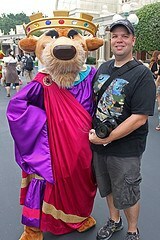 Apparently the name comes from the fact that Mickey would carry Duffy in his duffel bag. 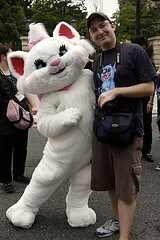 Duffy is insanely popular in Japan, as Jon and I discovered. There are at least three stores in DisneySea that solely sell his merchandise, and people come to the parks decked out in as much Duffy stuff as possible. 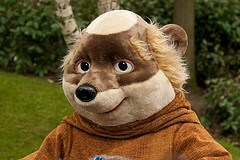 He also has his own show there, too, which is extremely popular. Overall Jon and I were not won over by Duffy and do not get all the insane hype surrounding him - especially the two hour lines to get into the show at American Waterfront, and the 30 minute plus meet 'n' greet line. But, the Japanese flock in their thousands to meet him, and carry his merchandise around all day with them. While we are on the subject of meet 'n' greets, this brings me to my next point about the peculiar Japanese rules and behaviour. 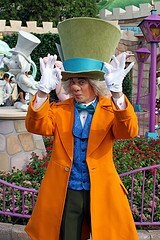 Firstly, in the US and Paris Parks, even if a character is very popular, has a long line, or being mobbed by Guests, you cannot poke, prod, tap or lift them. 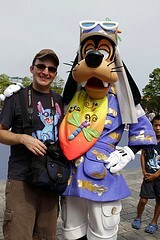 In Japan, Guests quite frequently hammer on the shoulders of the Characters trying to get their attention. They lift their skirts, shirts and other clothing items, and basically do anything they feel is OK in order to get their attention or jest around with them. This is certainly something I think the Japanese need to address, not just for the performer's safety, but for the integrity and dignity of the character (performer) trying to deliver the magic. 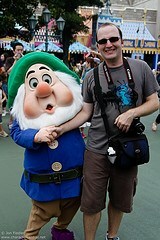 The second thing regarding meet 'n' greets is to do with photographs, again. It is apparent that when there is some sort of queue system in place (I.E. Ariel's Grotto, Mickey's House, Duffy etc), you are only allowed one quick group picture and you are rapidly whisked away. At the Duffy line it even goes so far as them taking your camera for you before you get to him, and taking you picture and ushering you out the way before allowing you to have your camera back. I am not joking. 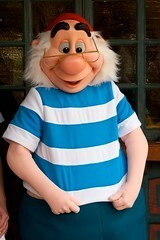 Duffy does not sign autographs either. 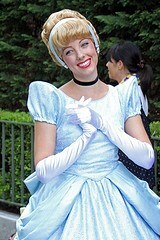 But this becomes even more ludicrous when for example, like happened to us, you meet a Character that has no line. We met Ariel in DisneySea one day, and she does have a queue line set up, but there was literally nobody there when we went to see her (which is a miracle in itself given the lines elsewhere in the park). But despite the non-line, and us being the only ones present, we were ushered in very quickly, allowed one picture each and basically pushed out the door. Beyond a joke? I think so. There were murmurs from within Disney that Oriental Land Company (OLC) might buy the US Parks and Resorts a while back, and I am glad that nothing has so far come of it. If OLC tried to implement any of this at the US Parks, I think there would be uproar from the Cast and Guests alike. Although I have written a long list of complaints here about our experiences in the Japanese Resort, it is purely because I want to forewarn people of some of the challenges they may face when they visit. 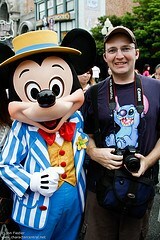 Despite it's problems, Tokyo Disney Resort is an amazing place. It has a lot of very new and different things to offer, and a lot of old favourites too. 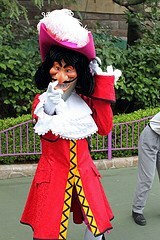 Tokyo Disney Resort (TDR) is set on the bay in the industrial port area of Chiba, just east of the main city of Tokyo. To get there from the airport you either need to get a train into Tokyo, then back out to Chiba, or a shuttle bus from the airport to your hotel, then whatever means that the hotel provides or is nearby (either local train or shuttle bus most likely). If you’re staying in Tokyo then a train is easy enough to catch, and the more local hotels to TDR nearly all have shuttles or are all very close to the train station, which is usually no more than one or two stops from TDR. Local buses are also a good way of travelling, as they are generally efficient, clean and run a full schedule every day. They go from all surrounding areas of TDR, and most stop at TDR. If you are staying at TDR (either at a Disney Hotel, or onsite partner hotel) then you have a number of options depending on the hotel, which I shall discuss later. So, you have boarded the train, probably from the Chiba / Urayasu area, and you area headed towards Maihama Station, which is the train station at TDR. When you arrive, and you exit the platform and enter the main station area, it consists mainly of a couple of shops and the ticket windows. When you exit the main doors, you are presented with a large walkway. Built into the station, now behind you (since you have exited), there are a number of shops, cafes and restaurants, and a small compact hotel - all built into the arches and underside of the station. You find yourself under a large canopy, and to the left you have Ikspiari, and to the right a large, unusual shaped store, and an elevated walkway that appears to vanish over the horizon. You can also see the Disneyland Hotel to the right, in the distance. In front of you is mostly trees, but if you walk to the edge of the walkway, you will discover you are raised up from the ground, and you are in fact up above a number of roads, the bus station and sidewalks. There are steps to get down to the ground level, and if you have arrived by bus - like we did sometimes - you will arrive down here and have to come up the stairs to be able to get around TDR. You see, the thing with TDR is that get around you have to use the elevated walkways. To get to and from any of the train station, monorail stations, Tokyo Disneyland Park, Bon Voyage, or Ikspiari, you have to use the large raised walkway. I can’t really say much else about that, except as a first impression it is kind of strange, and does not give off the typical “I am now in Disney” feel. It all comes across as being very industrial and cluttered. In fact, if you walk along the walkway further as though you were headed towards Tokyo Disneyland Park (TDL), you can see the highway to the right, some of the industrial areas that you pass on the train, and the actual railway lines that go in and out of Maihama Station. It certainly is not very magical. In all the other Resorts once you arrive at the Resorts you do at least get that “enclosed” feeling, like you have entered a new world. Despite this, the Resort overall is very clean, and very well kept. I have no issues with maintenance as it appears to be impeccable in every aspect - it's just the setting and theming I don't like! So where shall we go first? Well if you a foreign visitor (which if you are reading this then there is a 99% chance that you are), then you actually will need to collect your tickets, if you have gone to the trouble of purchasing them online first (I mentioned ticketing and the lines above). To collect you tickets you will need to head left out of the train station towards Ikspiari, and then straight ahead to the first building on the right. Here you will find a flight of stairs and a sign informing you have to go down to the lower level. Note that the collection office does not open before the parks - that would be all too helpful - it opens when the parks open. There is normally a rope up preventing you from going down until the opening time. 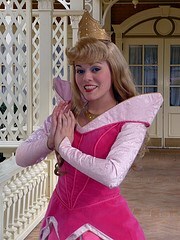 A Cast Member will come up and open it. Once inside, the CM’s speak English, and you will need to present your reservation number and the credit card you used to book the tickets. The process is very quick and easy, and you will have your tickets within minutes. Back up the stairs to the main (raised) level, and now to which park first? If you’re as big a Disney fans as us, you’ll probably want to go to the more traditional park first - Tokyo Disneyland (TDL). To get there you have to head back along the walkway, past Maihama Station, and towards the huge gold and blue hotel you can see on the horizon, the Disneyland Hotel. All the while above you, running from Ikspiari, and following your route to the park, is the monorail line. On your left you will encounter Bon Voyage (BV) which is a large store, similar to that of the World of Disney Stores in FL and CA. It has been themed to look like a giant suitcase and hat box sitting side by side, and inside the theming all revolves around travel and things that are in the suitcase. The store is fairly large, but not as big as you would hope, and contains a lot of the main merchandise lines from the parks. It is also, to my knowledge, and in our experience, the only place in the entire of the Resort that you will find pins (for Disney Pin Trading). Pins are not very popular in Japan, much to my disappointment. Bon Voyage is normally open before the parks, and stays open after they close. You keep walking, past BV, with the monorail line running above you, and follow the walkway to the left, under an unusual structure with a sign telling you that you are now entering TDL. The TDL Hotel will be on your right, growing ever bigger as you approach. You will notice the Resort bus drop off area (not the public bus station - that’s further round near the train station) to the left. You continue down the ramp, and you will see the unmistakable Disney Parks entrance area - ticket booths and a large open area - probably with huge lines to get in the park - leading up to turnstiles. It is a weird feeling arriving here in this manner; down a ramp onto a large concourse. 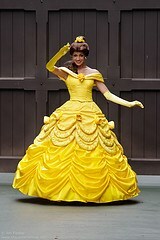 Somehow it is very un-Disney. But nonetheless, here we are. You will also notice ahead of you, and situated in front of the TDL Hotel, the TDL Monorail Station. I will discuss the monorails in more depth later. Even from the concourse area, while lining up it is hard not to notice the large structure ahead of you once in the Park. 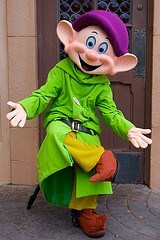 Once entered, it will become clear that TDL is immediately very different to all the other Magic Kingdom’s of the world. There is no train station at the entrance for a start, no Town Square, and the Mickey Mouse flower bed is set alone in front of the large glass housing you see before you. This is World Bazaar. 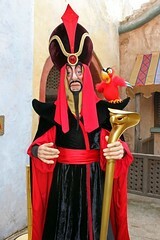 World Bazaar (WB) was the Imagineers’ answer to the harsh Japanese winters, and the intense summers. World Bazaar was actually meant to reflect more what its name actually implies. It was meant to be a collection of shops and restaurants that offered a unique insight into countries and cultures from around the world, much like EPCOT’s World Showcase. But for a number of reasons this did not happen, and eventually they decided to go with the more traditional Main Street USA theme, but just enclose it for the climate related reasons I gave above. I have to say that both Jon and I have mixed feelings about World Bazaar, and to be honest we both prefer the Main Street setting much better. It is probably fairly accurate to assume that the Imagineers also realised their mistake with World Bazaar, when they came to designing Disneyland Paris just a couple of years later (TDL opened in 1983, and DLP was began in 1988). How do I know this? Well at DLP Main Street USA is not covered, but the Imagineers installed something that is quite unique, and actually one of my favourite things about DLP - arcades at either side. These covered walkways, that are superbly themed, heated, lighted and offer other facilities too, are behind the main shops and restaurants on Main Street and offer that respite from the hot and cold, as well as a more unique way to traverse the street - especially when busy. So, the street remains open to the air, and offers the more traditional feel, but also can accommodate when the weather and crowds are not good. So TDL got the raw end of the design deal. Over what would be considered as Main Street is a massive glass housing that takes its influence from the days of the giant Victorian glass greenhouses. The problem with it is that is becomes very noisy underneath it, and when it does rain or get intensely hot, the world and his dog descend upon WB to take shelter from the elements. It also means that the parades cannot travel underneath, and instead take a very different route round the park from Fantasyland, round the Hub and up into Toontown. There are also no Main Street Vehicles, which is a real shame and really makes World Bazaar lose that flowing, American city feel. They do offer the Omnibus, but only on the Hub, and it literally just goes around the Hub in front of Cinderella Castle! The Omnibus does not make so many appearances any more though, and was not even in operation when we went in peak summer season. Overall the theming of World Bazaar is similar to that of Main Street, but actually lacks something (besides the vehicles and Town Square). It is very ‘flat’ for the want of a better word. Somehow it lacks in the depth and detail that the others offer. The stores are very basic in design, and the actual street is very bland looking. The fact that you have the giant glass housing does nothing for trying to convince you that you are walking down a real street. Overall though it offers similar fare to the other Main Streets such as an Emporium, a bakery, a corner café and other amenities and services that you would expect. The unique thing about World Bazaar (besides the roof), if that the streets that cross it aren’t just dead ends like in the US parks, they actually serve as real streets, and access the lands on either side that they meet. To the right you have Tomorrowland, and to the left Adventureland. We shall continue our tour though the traditional way, and make our way out of the WB canopy, and enter the Hub area of WB. The Hub area of TDL is enormous. It could easily swallow both Florida’s and California’s Central Plaza’s and probably still has room for more. 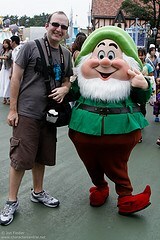 The idea was that Tokyo is so crowded, that the Disney Parks there should offer some respite from the close city areas. The Hub overall doesn’t offer anything extraordinary, but does have a number of interesting points to note. There are four turrets around the Hub that all hold lighting rigs and the operations booths for the shows that happen at the Castle. When not in use they look like normal towers, but when there is a show going on, the sides facing the Castle open up to reveal lighting and speakers. The restaurants around the Hub all take their inspiration from both the US MK style parks. There is a Plaza restaurant (from when DL had one - now an AP office), and a Crystal Palace (MK), as well as a Tomorrowland restaurant that equates to something like Cosmic Ray’s (MK). What is interesting about these restaurants is that they actually “technically” fall into the lands that they back onto, and do not form part of World Bazaar. So despite the Crystal Palace being the same as in the Magic Kingdom, and in the same place on the Hub, it is actually part of Adventureland. The Hub has a fair amount of activity throughout the day between the numerous Castle shows and the parades passing through. While we were there they had the summer events ‘Naminamina - Disney Kids Summer Adventure’ and the ‘Cool the Heat’ show that happened numerous times per day. Of a night time there was the special summer show ‘Midsummer Night’s Panic’. This was a fast paced show that basically involved Gantu and Dr. Hamsterviel trying to capture Stitch. In the end Stitch basically wins the battle by soaking them with thousands of gallons of water... and the audience too. 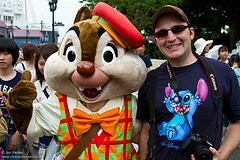 The Japanese go nuts over shows like this, especially when it involves Stitch and/or water! Naminamina was in front of the Castle (not on the stage), and involved characters dancing and singing to a very fast soundtrack, dressed in summer camp councillor outfits. The entire purpose or meaning of this show is questionable, as it didn’t appear to serve much purpose, besides rolling out several times a day to mass crowds and asking some kids to join them to dance with them (which does not happen in the other versions across the Resort). The Cool the Heat show at the Castle stage was basically any given two random characters dancing on the stage, again to a very fast soundtrack, and shooting thousands of gallons of water at the Guests below! The Japanese LOVE the summer water events and shows! Also in the mornings just after park open, in front of the Partners Statue a group of Hawaiian dancers performed for a short while to some Hawaiian (mainly Lilo and Stitch style) music. The Disneyland Band also occupied the same spots several times per day. Overall these three things I mentioned above were not amazing, but included some cute new character outfits and also more unusual characters also (such as the Three Little Pigs). Moving out of the Hub and heading left towards Adventureland now. Adventureland in TDL is a combination of a number of elements from the other parks, plus some unique parts too. They have their own version of New Orleans Square (but it is still Adventureland), and have a Jungle Cruise that is more akin to Florida’s (although it runs clockwise in Tokyo), they have a Tiki Room (although a different version from either of the US ones), and a Swiss Family Treehouse like in Florida and Paris. They also have a Pirates of the Caribbean, which is mostly similar to California’s, with a few minor alterations - the main one being the end scene with Jack Sparrow is flipped to the other side. The other main difference is that you don’t travel up a ramp to then be dropped into the water, but instead just get dropped, then at the end travel back up the ramp to the exit dock. Adventureland also has a neat little area that is made up of a number of juice bars and a Chinese counter service restaurant. It’s set aside from the rest of the land and just breaks up the land a bit more. They also have a stage that is currently playing the incredibly camp, but otherwise entertaining show ‘Minnie Oh! 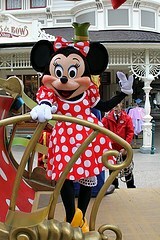 Minnie’. 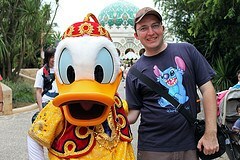 We really liked Adventureland at TDL and thought that it offered some unique twists on the other Adventureland’s. One thing that is completely unique about it is the Western River Railroad. As I mentioned at the start, World Bazaar does not have a train station. In fact, the park does not have a train that circles it. Instead they have a train, that for the most part goes around Western land (TDL’s Frontierland), but actually begins and ends in Adventureland. It travels around the Rivers of America and through a diorama much the same as California’s. Moving into Westernland now, TDL’s version of Frontierland. My guess with the name here is that Frontier doesn’t translate so well. Anyway, Frontierland in TDL also can be summarised in a similar way to Adventure land - some elements from the US parks, and some completely unique. Similar areas include a Country Bear Theatre like from Florida (though it was the Summer Vacation version whilst we were there), Big Thunder Mountain, a Mark Twain on the River, a Tom Sawyer Island, and a Diamond Horseshoe restaurant and stage. Big Thunder Mountain, although overall a very similar ride experience to the US parks (the speed being slow like CA’s), was laid out differently, and looked different from the outside. You had to go up a series of rickety (or seemingly so, wink, wink) ramps through the mine to the loading area. When the train left the loading area, it immediately entered a cavern before proceeding outside. There is pretty much no point in the park where you can see onto BTM, with exception of from the Western River Railroad, which is interesting because in the US parks and in Paris you can quite clearly view the trains thundering round the mountain. There was no Haunted Mansion in Westernland, as this is over in fantasyland instead, which I will talk about a bit more later. There were some really neat walkways and “hidden” areas of their Westernland, which made it feel very different and unique, but also a lot of very open concrete areas, that could do with some planters or water features to break up the vast open concourse look. Immediately joining onto Westernland, and sitting between WL and Fantasyland was the entrance area to Critter Country. Critter Country in TDL was very neat because again, it offered something a bit different. Some hidden walkways, a fabulous counter service restaurant, some stores, and of course Splash Mountain. Critter Country in TDL far surpasses DL’s Critter Country. Splash Mountain was very different. The whole queue area was set in a neat cavern. In Florida they are just dark tunnels made of rock, but in TDL they seem to have taken that idea and expanded it, making it better. I can’t really explain why or how, but it was just more interesting, bigger and lighter. The loading area was inside, not open air like FL, and the actual ride experience was just different. Overall I would not say the ride itself was better that Florida’s (California’s is just outright bad), but it just offered something different - a fresh approach to a WDW favourite. The down side to Critter Country is that despite everything it offers, it can be very cramped, and suffers from mass crowds of people trying to get to Splash Mountain. Critter Country at TDL also offers the Explorer Canoes the same as Disneyland CA. Now we continue our grand circle tour, and enter Fantasyland. There is one down point I need to mention here about Westernland before we continue. Westernland and Fantasyland in TDL basically merge into one. There is no real defined point where one becomes another, and this is really disappointing given the overall great theming of Adventureland, Westernland and Critter Country. There is just a big open area, and the lands just “meet”. What doesn’t help the matter is that in TDL the Haunted Mansion is classed as being in Fantasyland, but sits right on the border between the two lands, making it feel even less like there is a real separation between the areas. Fantasyland also suffers with the fate of having some of the worst versions of the classic Disney attractions anywhere in the world! 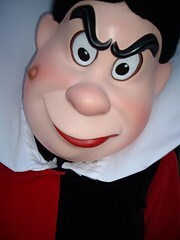 Snow White’s Scary Adventures from start to finish is a grim experience, with very little in the way of theming in the queue, to completely lacking an ending altogether. 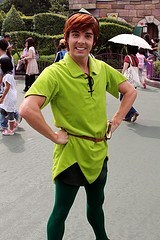 Peter Pan’s Flight is not quite as detailed, though the upkeep is better than Florida’s. The queue is also pretty dire. During the ride some of the scenes are a lot closer to you, to the extent where you can touch them (though you’re not meant to of course). Dumbo the Flying Elephant is the most appalling looking ride you could imagine, and completely lacks, well, anything. The Tea Cups are overall not worse than Florida’s, but their setting really lacks something. Then we move onto their “it’s a small world”. Previous to this trip we had experienced three IASW’s (FL, CA and Paris). Florida has always been the worst, with Paris’s being the most visually stunning. Tokyo’s IASW is miserable beyond comparison. TDL’s IASW is dark, unthemed and pretty empty inside. The outside attempts to resemble CA’s or Paris’s, but that’s about the nicest thing about it. The queue area is a concrete tunnel, and the loading area is an indoor lake with awful murals. The whole ride from start to finish is probably the worst Disney attraction I have ever experienced. 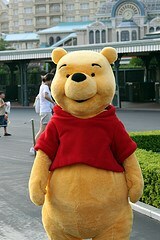 Fantasyland does have just one redeeming point though, and that is Pooh’s Hunny Hunt. Pooh’s Hunny Hunt I warn you, attracts 200 minute lines from park open to close, and FastPasses go pretty quickly. We were lucky enough to be able to ride twice, and we LOVED it. It completely puts to shame the US versions - especially Florida’s (pre-2010 refurb, though even after that it’s only the queue they have improved, not the ride). The queue is set in lush green gardens, complete with giant storybook pages. When you get to the loading area you will immediately notice that you sit in honey pots, not bee hives, and that there is no track! The ride vehicles for PHH are completely free roaming, and their routes through the ride are determined by an intelligent computer. The scenes are bigger, better, more colourful and more interesting. The special effects are far superior, and the ride is longer too. The whole free movement idea allows the vehicles to travel not just forwards, but backwards and sideways too, making the whole ride experience simply wonderful. The Haunted Mansion’s overall ride experience is just about the same as the US versions (but does not include the newer scenes added to the US ones), but the outside setting is better than Florida’s. The gardens are more unruly, deliberately of course, and the house itself has a few different touches, such as an open, broken window with a curtain that flutters in the breeze. Fantasyland also includes a Carousel, and a Pinocchio’s Daring Journey which was closed during our visit. Next we move onto Toontown. As with the Westernland-Fantasyland border, the border between Fantasyland, Toontown and Tomorrowland is virtually non-existent also. 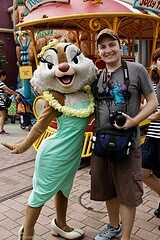 Toontown in TDL is much the same as the one in California, with two exceptions. One, it is completely the reverse of California (I.e. mirror image), and two, it is bigger with more open space. 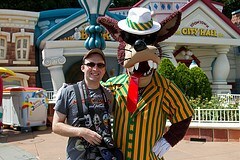 Overall Toontown does not offer anything new or exciting that cannot be found anywhere else - with maybe one exception. 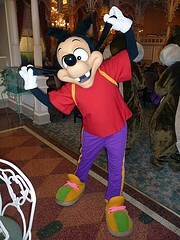 TDL’s Toontown does feature some more unusual characters from time to time. When we were there in the summer, for example, the Big Bad Wolf was making appearances! Out of Toontown and almost immediately you enter Tomorrowland. Next to Fantasyland (literally and figuratively), Tomorrowland is the worst area of the park. 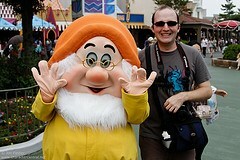 It only pips Fantasyland slightly because of some of the more interesting attractions on offer. Tomorrowland seriously needs a massive update, suffering from the Yesterdayland syndrome that the other Tomorrowlands have suffered in the US parks. Big, open areas with no or little theming, and bland white buildings that look like they could quite as easily be offices pretty much sum up Tomorrowland. The attractions on offer are slightly better though. Space Mountain is of course the big one, and although no more exciting from the outside than the US ones, at night it is illuminated like the CA one. The entrance and loading areas are different too. The loading area more resembles CA’s, but has a number of cosmetic alterations. There is onboard audio during the ride and the ascent and end to the ride are quite different, offering better special effects. The Star Jets are just pitiful up on their boring white plinth, and Captain EO and Buzz Lightyear’s ride suffer from the office block look I described above. Star Tours looks somewhat more interesting with its shuttle hangar entrance area (probably the best bit about Tomorrowland), but past that it is pretty much identical to all the other versions, bar some cosmetic differences in the loading area (and of course the fact that the commentary is in Japanese!). There is one other attraction (besides the Speedway), and that is Monsters, Inc. Ride and Go Seek. This ride is probably the most popular in the park bar none, even more popular than Pooh’s Hunny Hunt. The lines are insanely long, and people will race you to the FastPass line. An hour after park open there will be 200 minute lines and no FastPasses left. We managed to ride it once (thank God for FastPass!! ), and I have to say overall it was just ok. Nothing special to be honest. The scenes, though somewhat different, were very similar to the Monsters, Inc. ride over at California Adventure. There were some new scenes though, and the ride is more interactive, as you get a torch to find the monsters during the ride. The problem is that you don’t get a score at the end, which makes you wonder what the entire flash light thing was about. Tomorrowland does have one very neat counter service place called Pan Galactic Pizza Port, and although it doesn’t serve the best food, the theming inside is neat. Tomorrowland is also the home to the One Man’s Dream show. A spectacular character filled musical show with all you favourite Disney stars, you have to get in the park early to see the non-lottery showing, or be very lucky and get picked from the lottery (very frustrating and never guaranteed). Tomorrowland also sometimes has a roaming band called Cosmax, and they also occasionally play before One Man’s Dream starts. 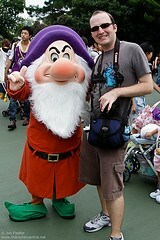 The parades at Tokyo Disneyland are spectacular and well worth seeing multiple times. In Jubilation!, the day parade, the floats are amazingly coloured and detailed, and feature some unusual characters (such as the Three Little Pigs, Mowgli and the Brer’s for example). 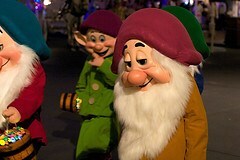 Dreamlights, TDL’s night time parade FAR surpasses ANY version of the electrical parades I have ever seen, at ANY park. It is a visually stunning cavalcade of colour and music that will delight and enchant even the most cynical of people. Highly recommended. It also features some interesting characters not normally seen in the electrical parades, from Marie, the Pooh friends and some PIXAR pals. 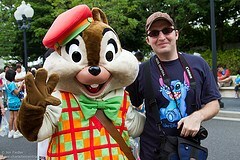 Tokyo Disneyland Park is well maintained to a very high standard, clean and friendly. There are areas that we really love, especially on the left hand part of the park, and some areas that need improvement, namely Fantasyland and Tomorrowland. I would highly recommend any Disney fan to visit, but just not in peak seasons as the crowds and the weather can be INTENSE. At this point, I need to make an addition to something I mentioned previously regarding photography. After reading my blog post, Jon pointed out that although I was correct in my observations about the bizarre photography rules in Tokyo Disney Resort, I didn’t mention the fact that these rules were not posted anywhere. The reason this is important is because when you are at a park, and you have a camera, what are you most likely to do? Take a photo of course (or many in our case, but anyway). So when there are no signs posted anywhere telling you about the whole no pictures in queue areas and shows, well to be honest you’re not going to automatically assume you can’t, right? So yes, the photography thing is stupid, but what is more stupid is that they don’t make this clear, and you can get in trouble when you DO take pictures… even though there is noting posted telling you not to! Ok, that’s that dealt with! I would also like to add at this juncture, that while Japan has a reputation for being ultra advanced and glowing with electrical supremacy, we discovered that actually this was not really the case. We were some what disappointed by the lack of technology actually. In particular, air conditioning! Now I realise that not everywhere in the world has the same priorities as the US (I myself am not American), but when it comes to public places and theme parks and other areas used frequently by massive amounts of people, you would think that air conditioning would be a basic amenity, no? In Europe we don’t have AC in homes and many smaller shops like is the normal thing in the US, but it does exist in newer buildings, larger buildings and offices. But Japan is a country, as I discussed in an earlier report, where the summer temperatures can exceed 35C/100F. To not have AC in a boutique in a theme park where there are 100 people trying to cram into a space the size of a living room, really does not do much for Guest comfort. The lockers and the restrooms were the worst culprits. If you need the bathroom, make sure you visit the ones inside the counter service restaurants in the parks, and not the ones that are dotted around the parks. They tended to have some form of AC. As for the locker storage areas, well unless you want to die of over heating then try to avoid going in there! The temperatures in those places must have reached in excess of 100F quite easily. While we are talking about lockers, I want to mention the difference between the Tokyo Disney Guest storage, compared to the US and Paris parks. In the US Parks, you can rent a locker starting at about $7 a day depending on the size. You can go back and put things in and take things out as many times as you like. The main difference between WDW and DLR is that you can pay cash in WDW because they still dish out keys, but you have to pay with credit card in DLR as the lockers are all automated. In DLP they no longer offer a traditional locker service, but do still have Guest storage. You go to the window, give your things to the CM and they give you a ticket for your items. You may go back and rearrange things at your leisure, just as you do in the US. I don’t recall exactly how much it costs, but it is about the same as the US (we use it all the time, but never have to pay because AP holders get it free!). Now to Tokyo. Tokyo, being apparently most technically advanced city on Earth, still has coin operated lockers. Yes, you heard me - coin operated. To begin with, the prices are much the same as the US, but the problem that is one time use. To continue usage after opening you need to pay over again! Bear in mind that all the time you messing around trying to find more coins, you are probably melting into a pool of sweat due to the excessive heat. 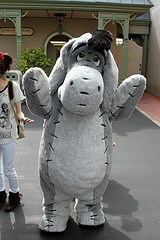 Now we come to Tokyo Disney Sea (TDS), or more accurately, how to get to TDS. 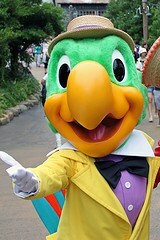 Tokyo DisneySea is the second gate at Tokyo Disney Resort, after Tokyo Disneyland. It physically joins on to TDL, but is not as easily accessible as the DLR and DLP parks, where they are just a short stroll. To get to TDS you have four options. You either take the monorail, you get a bus, you can walk, or you stay at the Hotel Miracosta. Let us begin with the monorail. The Disney Resort Line is TDR’s very own monorail system that makes four stops around the Resort. The stations are conveniently placed, are large and airy, and offer a number of amenities, such as restrooms (albeit still not air conditioned, despite being relatively new). Resort Gateway Station, situated right in the middle of Maihama Station, Ikspiari and Bon Voyage. Tokyo DisneySea Station, situated at the entrance of TDS Park, and easily accessible to Guests of the Miracosta. There are a number of drawbacks to the monorail system in TDR though, the main one being you have to pay! It isn’t cheap either. 100 yen is approximately one US dollar (more or less). To get into Tokyo itself, it costs around Y210, or about $2.10. To use the Disney Resort Line it costs Y250 single! The price is fixed and does not change whether you go one stop or three (you could go four, but you‘d end up back where you started!). I should add here that if you are staying for a number of days, they do offer passes which work out at a discounted price, but even still, having to pay is annoying! Apparently the reason you have to pay is that under Japanese law anything with more than two or three stops (I can't remember which), classes as public transport, and payment is required. You would think that Disney would offer maybe two monorail lines then, with two stations on each. But of course they don't as they use this law to make sure they maximise profits. The monorails run about every five minutes and are generally better than the ones in the US. They have neat Mickey shaped windows and Mickey grabs for those who stand. They also have CM’s on board who walk up and down, but there is no driver, and the cockpit is completely open to who ever gets there first. The views from the monorail is pretty neat at times as you pass by some other areas of the Resort and behind the parks, offering a unique perspective. The other problem with the monorail is that it only runs in one direction. Not all too inconvenient I guess, but a little strange all the same. It makes travelling from Maihama Station to TDS Park in the morning a long trip, but getting back at night easier, as the monorails travel anti-clockwise in the order I listed the stations above. Do not be fooled into thinking by the way, that you need to use the monorail to get from Maihama to TDL Park / Hotel. As I described in my last blog entry, you can quite easily walk, and it is not very far at all. As for getting to TDS, the easiest option in all honesty is the monorail, but there are two other options (besides staying at the Miracosta, but then you have the reverse problem of having to get the monorail to ALL the other resort areas - Ikspiari, TDL, Maihama etc - as TDS is the ONLY other thing over that side). You can walk, which to be fair is not that far, but is a fair distance when you are out all day in 100F heat and running round like crazy. When you feet ache and it is 10pm, the monorail is so tempting! But there is also one other option, slightly less convenient than the monorail but better than walking. The Ambassador Hotel’s bus. Disney’s Ambassador Hotel is situated just behind Ikspiari, and is easily accessible to anyone arriving at Maihama to visit TDR. The bus service they provide is actually meant for Ambassador Hotel Guests, and provides transport from the Ambassador to TDL and from the Ambassador to TDS. If you walk down from Maihama / Ikspiari etc to TDL and don’t go quite as far as the park itself, you will see on the left the resort bus station, which I described in my previous post. The buses are really neat looking and are silver in colour. They are free to use, and you do not need to show Resort ID or room keys to use them. So, you board the bus to the Ambassador, and when you arrive you get off and switch over to the next bus which usually arrives within minutes, to get to TDS! They are pretty cool to ride, and you get a different perspective of the Resort areas too. It really does not take too long, and is worth saving the Y250 per person, per trip on the monorail. You could always walk to the Ambassador, and then catch the bus to TDS also. Either way, it beats walking the whole way, and beats paying over the top prices! For Guests at the TDL Hotel, you can do much the same as I described above, but your walk will be longer if you decide to walk to either the Ambassador or TDS itself. To use the free bus to the Ambassador, you are actually closer to that than anywhere else in the resort. To use the monorail, you have a station right outside your door. No buses are offered from the TDL Hotel to anywhere else on property, just the monorail or Ambassador bus. If you choose to stay at the Miracosta, again, no buses are offered at all. You have to walk, use the monorail, or use the free Ambassador bus (but in reverse to how I described), to get to the other resort areas. For Guests at the onsite partner hotels, to be honest your only option really is to use the monorail from Bayside Station, or walk down to the TDL Park entrance area and do everything I described above. Walking will of course add much more time and effort to the ordeal, and I advise that you probably should use the monorail, as annoying as it is having to pay. Those staying at the Sunroute Plaza are the closest to TDL Park and could probably walk it, but it is still a bit of a distance. Ok, so we have beaten to death all the transport options, and we have now finally arrived at TDS. The park entrance plaza is surprisingly compact overall, compared to the amount of usage it receives. As I already said before, arriving early is advisable if you are travelling in anything but the bleakest of winter. The park entrance is technically in the Mediterranean Harbor area of the park. Mediterranean Harbor mainly comprises of shops, restaurants and the large expanse of water in the middle of the park where all the major spectaculars happen. To the right of the entrance is the Hotel Miracosta. The hotel sits at over the entrance to the park and has its own private entry into Mediterranean Harbor for hotel Guests. Once through the turnstiles, you immediately notice the large rotating globe fountain. Just ahead are the “tunnels” that go under the Miracosta which sits above the Harbor, leading to the main Mediterranean Harbor area, and thus into the park proper. There are all the usual amenities that you can expect from a Disney Park entrance, and does not offer anything especially interesting, besides the different theming. The stores around the main entrance plaza area offer a generic array of merchandise from the different areas of the park, and serve much the same purpose as Main Street in the MK style parks. Through the tunnels and out into the main Harbor area, you cannot help but notice the mountain across the lagoon - Mount Prometheus. Erupting loudly every so often in clouds of fire and smoke, Mount Prometheus is the Park’s icon, and can be seen from most points in the Park. Wandering around Mediterranean Harbor you will come across even more boutiques, and restaurants that offer a variety of dining options. Attractions in this area are limited, but include the Fortress Explorations and the Venetian Gondolas. The Fortress sits on the side of Mount Prometheus across the lagoon. Mixing styles from numerous European influences, the castle is stunning in its theming and design. Inside you can find a whole manner of treasures, from murals, activities and tableau’s. The views from the top are good too. The Venetian Gondolas offer a slightly different experience, and are tucked away around the corner. You can get a unique perspective of a very small section of the Park from the low down water ways that the gondolas traverse, and offer a more sedate option for those finding the heat and crowds too much. Mediterranean Harbor also has one of the stops for the DisneySea transit Steamer Line, which I shall discuss a little later. Overall the theming of Mediterranean Harbor is extremely detailed and presented. Once per day there is a spectacular show presented on the water called Legend of Mythica. To be honest I am not entirely sure what this show is about. The Japanese shows are very confusing at best. It basically involved the Disney characters coming out on large barges designed to look like mythical creatures, and unlocking some mystery or legend (the legend of Mythica). What the legend was actually about though I’m not sure. 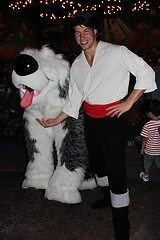 There seemed to be a lot of music and the characters did some dancing while their barges move past you on the water. The outfits are neat, and the show is definitely very cool to see. The barges are extravagant and the setting against Mount Prometheus couldn’t be more grand. I would recommend this show to everyone just for the colourful and impressive nature of it, and for the Disney characters in neat costumes, even if you can’t understand it! Of an evening they also hold another water based show in the lagoon called BraviSEAmo. BraviSEAmo is another of those “I’ve no idea what this is about but it look cool” shows. The only character appearance is a brief moment where Mickey comes out on a boat and says something before going back in again. Using water fountains and some impressive “puppets” (not sure what else to call them) the show is entirely water, fire and light based. Large creatures representing fire and water emerge from the lagoon and fall in love (apparently according to the programme guide). Although not the most spectacular show, it was neat to see once. The show is actually being replaced and to my knowledge had its final performance just recently. Next year a brand new show will open called Fantasmic, and is expected to be a cross between the Fantasmic from the US parks, and the World of Color from DCA. When you are in the park, your natural instinct will want to take you up to Mount Prometheus, and although you can get across the park in a number of ways, I think your curiosity will drive you towards exploring the depths of this fiery mountain. 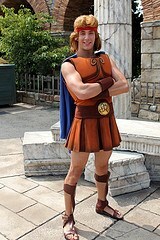 As you walk up past the ancient Grecian ruins be sure to look out for Hercules! 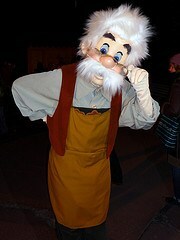 He makes appearances from time to time around there, and is an incredibly rare character to the other ten Disney Parks of the world. As you draw nearer, take a moment to look over the terraces back towards the Mediterranean Harbor and you will be treated to some cool views. You will also notice from these vantage points the Tower of Terror and the large steam ship sitting beyond the Harbor in American Waterfront. Entering under the cavern-like archway into the enclosed bubbling volcanic spring water basin, you will notice the gangways and machinery installed across the mountainside. With loud volcanic sounds and geysers gushing up from the springs, accompanied by the drilling equipment and the docked submarine, you know you have entered somewhere quite mysterious… Welcome to Mysterious Island. Mysterious Island is takes its inspiration from the great novelist Jules Verne, and his stories of futuristic travel and exploration. Mysterious Island uses a lot of design elements seen at Disneyland Paris, such as lamps, snack cart theming and signs. Mysterious Island has just two major attraction, and two restaurants. It also has a small boutique and a number of snack carts. The first attraction, and probably the most popular in the whole park, is Journey to the Center of the Earth. This ride, like Pooh’s Hunny Hunt and Monsters Inc in TDL Park, can attract lines in excess of 200 minutes within an hour of park opening. The theming and setting is second to none. Set inside Mount Prometheus itself, deep down in the fiery depths of the Earth, ‘Journey’ is a mixture of thrill ride and dark ride. After queuing through what seems like an eternity, you end up at some doors. You travel down in an elevator to a lower level where you board your drilling vehicles. As you set off you see some amazing rock and crystal formations, then things get a bit dark and mysterious, and you come face to face with an amazing subterranean life form the size of a small house. 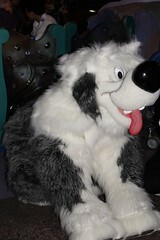 This animatronic is probably one of the best Disney has ever created. The disaster! The mountain erupts, and you are sent hurtling through the dark caverns and come to a grinding halt back in the loading area. Sounds pretty neat doesn’t it? Well it is, with one major exception - the ride is way too short. All this happens in about two or three minutes. The build up is the main part of the ride, and the thrill bit just, well happens. You get sent off rushing through the tunnels only to find that after two bends the ride is over. The sudden stop in the ride and no real conclusion is a massive let down, and certainly not worth the 200 minute waits. Of course I would go on it again, but we had to wait half an hour with FastPasses alone and I probably wouldn’t even wait that long in the future. I would recommend it definitely if you have time to spare, or if you really can’t resist the lure of the incredible setting, but I will only go on it again if I can get FastPasses and wait no more than 15 minutes. The only other attraction in Mysterious Island is 20,000 Leagues Under the Sea. This ride is nearly as popular as Journey, but not quite as much. Normally FastPasses are still available a couple of hours after park open, and the lines are still relatively short for the first hour. I personally loved this ride. We managed to go on it twice, and is only one of three attractions (not including shows or parades) in the entire of Tokyo Disney that we went on more than once (one being Pooh’s Hunny Hunt, the other being Sindbad’s Storybook Voyage which we’ll come to later). 20,000 Leagues is another dark ride attraction that is based on the Verne novel of the same name. To get down to the loading area of your submarine, you have to go down a winding gangway into the rock face, then through the offices of Captain Nemo. Once at the loading area, you board your very own mini submarine. Seating up to six people they are dark and small, and not for the claustrophobic! Nonetheless, you sit on benches looking out of portholes. It sort of equates to the Nemo Subs at DL CA, but the vehicles are on a much tinier scale. The other major difference is that they are not set in the water, but are on a guide rail much like that used for Peter Pan’s Flight. The subs set off and you are submerged into the dark and mysterious undersea world. You pass through lost treasure troves, sunken ships and other delights, before encountering the Kraken! Following your electrifying visit with the giant squid, you find yourself in an unfamiliar realm - you have discovered the lost city of Atlantis! Come face to face with Atlantians and discover their magical home, before resurfacing again. This attraction is one of my favourites from the whole trip and I highly recommend it to everybody. It is a long ride too, which makes up for the poor experience of Journey. From within the crater of Mount Prometheus, you now have a number of options. You can head back out to Med Harbor to walk down to American Waterfront, or you can head directly to Port Discovery, or you can head in the other direction and go to Mermaid Lagoon. We shall continue our tour though by going to Mermaid Lagoon. As you turn right down the passageway, you will emerge onto a more open area where ahead of you in the distance you may notice some Arabian style turrets, a waterway beside you, and over to your left an unusual structure that resembles a castle but made of shells. 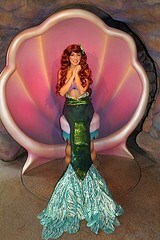 Mermaid Lagoon is a “two part” land, as it has an outdoor area with attractions, and an indoor area with attractions. The outdoor area comprises of a small coaster similar to the Barnstormer and Go Coasters, Ariel’s meet ‘n’ greet grotto, and spinning attraction similar to that of the Slinky Dog Spin in Walt Disney Studios Paris. The bulk of Mermaid Lagoon is made of a massive indoor complex that is superbly themed, colourful and provides a welcome escape from the intense summer heat. Once down inside the main area of Triton’s Kingdom, there are a number of attractions. Jumpin’ Jellyfish is a vertical drop attraction more or less identical to that in California Adventure (DCA), Blowfish Balloon race is a spinning elevated ride much the same as Flik’s Flyers in DCA, The Whirlpool which is basically the Tea Cups, and a small children’s play area. Mermaid Lagoon Theater hosts a short musical Little Mermaid show. The show is performed almost completely in the air above the audience and features some neat puppetry. There is also a counter service restaurant that serves ocean themed fast food, and three main gift shops that all run into one really). Across the river from Mermaid Lagoon sits the desert market town of Arabian Coast. Built from stone and tile, and complete with minarets Arabian Coast is home to some unique treasures. There are three main attractions here. The first is Sindbad’s Storybook Voyage (yes, the spelling of Sindbad is correct even though we don‘t normally spell it that way) which is a boat ride through the adventures and travels of Sindbad and his tiger Chandu. It is a very similar experience overall to “it’s a small world” - slow moving boats, musical scenes with singing dolls, but has of course an Arabian twist. Some of the scenes are very detailed and overall we really liked this ride, especially Jon. Lines are never very long. 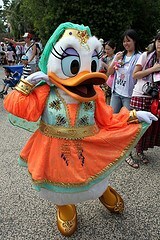 The other attraction here is The Magic Lamp Theater. This is a mixed live action and 3D show about the Genie from Aladdin. The story basically involves a magician who wants to become all powerful (sound familiar? ), but in the end is defeated by the Genie and the magician’s assistant. It is an interesting show, not amazing, but interesting, and definitely worth seeing if you are curious as to how live actors can interact with 3D projections. Line lengths can vary, but overall never very long. Opening next year is Jasmine’s Magic Carpets (name subject to change), which is basically a copy of the carpet ride form both Florida and Paris. The third attraction is Caravan Carousel, which for the most part is a normal carousel, but is unique in that it is two storeys. For the last two summers the courtyard area has been host to a special night time event called the Bon Fire Dance. The stage is set up in the middle of the courtyard and views are available the whole way round, but the characters do tend to be more towards the south side. Basically, from what we could understand (as with all the shows in Tokyo Disney Resort, the storyline was fast paced, confusing, and in some cases seemingly non-existent!) the Sultan was upset about something (I figured the fire going out, but who knows), and Aladdin and Jasmine decide to restart it with the help of their friends. They call in the help of Mickey and Minnie, and some dancers who then all frantically run around the centre stage chanting, singing and dancing (to a very neat and catchy song I have to say!) and each time they pause, the bon fire in the middle gains more strength until the end when it roars into full life. The Sultan returns (atop a building with the Genie in tow no less) and all is good. Going back to what I said in an earlier report, the Japanese will wait for hours for something, and this is no exception. The special seasonal events like Bon fire Dance are the biggest example of this. We literally, no kidding, saw people waiting from around 9am to see this show, bearing in mind it is a night time show, and the first one (there were two nightly) wasn’t until 7pm. Luckily we had a lovely Japanese friend who “knew the system”, and we were able to get in with her at the last minute both times we saw it, and get good spaces to watch it. Wandering back over the bridge, past Mermaid Lagoon, and heading round to the right you leave the desert and the underwater kingdom and enter the dense jungle. Here you will find hidden temples, lost treasures and ancient curses - you have entered the Lost river Delta. There are two main attractions here; both are copies from other parks. The first is the Indiana Jones Adventure: Temple of the Crystal Skull, which is the same as in California (albeit with some minor details inside and the facade). The second is raging Spirits, which is the roller coaster from Adventureland in Disneyland Paris. Of course both attractions have a bit more theming here, and look better - this is DisneySea after all, but the overall ride experiences are the same. Lost River Delta is also home to a stage show called Mystic Rhythms which we did not get to see, but were informed by people that we weren’t missing much! Lost River Delta also hosts some unique characters. 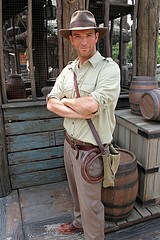 There are the usual suspects such as Mickey, Donald, Goofy and Minnie - and even Max - in themed outfits, but also the one and only Indiana Jones! He doesn’t have a listed time, but tends to come out around lunch time from what we discovered. He roams around and can be lost very easily, so you have to keep an eye out and be quick to grab him when you do spot him! 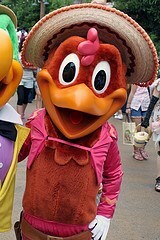 The other two characters that feature here on a regular but random basis are Panchito and Jose. They used to meet in EPCOT but left a number of years ago. Leaving behind the jungles of the world we walk down a pathway and find ourselves at what looks like a futuristic research station on the waterfront. 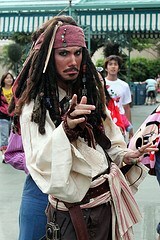 You have entered Port Discovery. Port Discovery is all about the water and the weather, and has a view out to the sea - literally. There are boats spinning on the water, an electric railway overhead and a large research facility, all making Port Discovery a very energetic place. Once again there are two main attractions here. The first is Aquatopia which involves boats spinning apparently out of control on whirlpools of water round the lagoon in front of the research centre. Sadly we did not get to ride it, but it is on show for all to watch, and looks like a ton of fun. It especially looks cool at night when everything is lit up. The other attraction is called StormRider. Using a similar technology to that of Star Tours you are sent on a mission to save Port Discovery from certain doom as a massive storm approaches. You are sent up in a specially designed aircraft to intercept the eye of the storm and launch a missile into it that will supposedly diffuse the storm before making landfall. Of course there are always complications along the way, but in the end all is resolved, kind of. I say kind of because at the end the “craft” you are in plunges into the water and then the viewing screen closes up and that’s it, you’re done. So… did we drown? Did we get rescued? It seems a very abrupt ending, but I guess we are left to assume that in typical Disney style we are rescued, but I guess we’ll never know for sure! Lines for this can be especially long, and although is a neat and unique attraction, I wouldn’t waste my time waiting any more than 20mins for it again, or without FastPass. 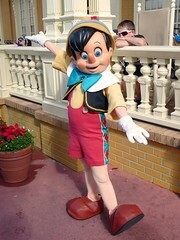 Port Discovery is also home to the Park’s only Character Dining experience, at the Horizon Bay Restaurant. The overall theming and details of Port Discovery are neat, and reflect something of a cross between Discoveryland at DLP and the US Tomorrowlands’. Wandering round the waterfront, down the path and beyond the trees you come to a quant little fishing village complete with a lighthouse and boats on the water - welcome to American Waterfront. American Waterfront has a number of areas to it. The New York streets, the New York harbour area, and the Cape Cod fishing village. The main attractions at American Waterfront are the Tower of Terror and three stage shows. The Tower of Terror, although we did not ride it, I understand has a different storyline that is to do with a cursed idol. There are also vehicles that travel around the area in the same way that the Main Street Vehicles operate in the other Disney Parks. They also have their own version of Turtle talk with Crush. The overall theming of American Waterfront is pretty good and it has that moving, busy feel to it that makes it feel more like a typical American city. The main show in American Waterfront is Big Band Beat (BBB). BBB is housed inside the Broadway Music Theatre. The show is very popular and runs several times per day. Inside the theatre is fairly big and is more akin to a normal theatre than most Disney theatres normally are. Complete with Disney Characters, jazz music and other performers, BBB is a neat show. I personally can’t see what the massive hype is, as it does get ridiculously busy, but it is a good show nonetheless. 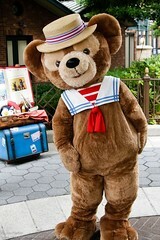 The second major show in American Waterfront is My Friend Duffy. Although this show is nowhere on the scale and scope of BBB, it attracts just as many people and is undoubtedly the highlight of all Japanese visitors day to TDS! 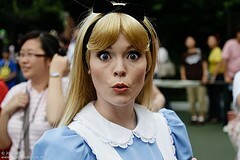 The Japanese are totally obsessed with all things Duffy. Set inside a counter service restaurant, you have to line up early to be able to watch the show, and have to be prepared to order food and eat. You cannot see the show without a purchase, but this can range from just snack to a full meal. Lines are frequently an hour or more to just order your food. The actual show itself is cute, but nothing spectacular and rather short. 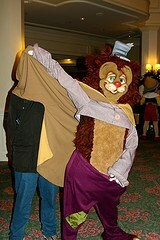 It basically involves Mickey’s bear - Duffy - coming to life and them going on (unseen) adventures together. If there is less than a half hour wait for food then I would say see it, if the line is longer then you are better off doing something else. The third show in American Waterfront is called Over the Waves. To be honest aside from having something to do with a dream cruise and some stow-a-ways, we have no idea what on Earth this show was about. It involved 1980’s style dancers, a strong man, a rather sprightly elderly couple and the Characters doing lots of frantic running around! Set outdoors in front of the large ship that shares American Waterfront’s skyline with the Tower of Terror, it also can get quite busy, but you can normally get a good spot a short while before. We have recently heard that this show has now ended. Whether this is just for the holiday seasons that are coming up (Halloween and Christmas have their own offerings, and this was more a summer show), or whether this is permanently gone, I have no idea. Either way, once was enough for us. So we have now completed our grand circle tour of the most extravagant Disney Park ever built. There are a few other things I would like to mention before finishing up though. There a number of ways of getting around the park that I haven’t mentioned yet. The DisneySea Transit Steamer Line is a ferry boat system that operates around the park in a clockwise direction. From Med Harbor to the Lost River Delta is a one way trip, and the same from there to Med Harbor. If you board in American WF though, it is a complete round trip with no stops - so more like a ride than transport. It makes for a nice break and gives your feet a rest. Not the most efficient mode of transport, but you get some cool views from the waterways that you wouldn’t otherwise see. The other method of transport is the DisneySea Electric Railway. This does one way trips back and forth between American Waterfront and Port Discovery (which really aren’t that far apart). It is elevated so the views are good, and again gives your feet a rest, but again is not the most efficient transport method. I would say that the vehicles I mentioned before in American WF provide transport, but as far as I could make out, they did not appear to stop but instead made round trips. If anyone knows better then please let me know! Finally before I give my closing thoughts, there are a couple of entertainment options I want to mention. Both Arabian Coast and Med Harbor have resident band that play appropriate music at intervals throughout the day. 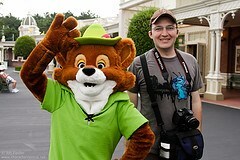 During the summer they also have something called Chip and Dale’s Cool Service. This was a water based entertainment that featured Chip and Dale, and sometimes Mickey and Goofy aboard boats that travel around the waterways of the park. Their main aim is to soak people and cool them of the summer heat. If you want to watch, they have some cute boats and costumes - but beware, stand too close to the waters edge and you WILL get soaked! They are armed with water cannons and are not afraid to use them liberally at all who are in range! Despite the Park’s astounding theming and detail, it lacked something for us. 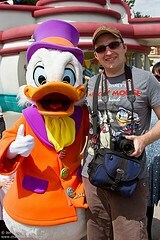 When we visit the Disney Parks in the US and France we feel “at home”. There is something welcoming and inviting about those parks that makes you have that “let’s just sit here and stay a while” feeling. I can quite happily spend hours wandering round Disneyland Paris, the Magic Kingdom or Disneyland just doing nothing in particular, and I feel happy and at home. 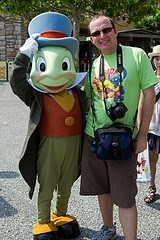 But DisneySea really lacks that friendly feeling. The theming and expensive feel to the park make it more like a museum where you can’t touch anything rather than a family and fan friendly theme park. It’s like the difference between having the best friend you do everything with (Disneyland) and the friend who you don’t see so often who you are unsure of, and you never quite “get them” - that‘s DisneySea. What doesn’t help are all the totally wild and ridiculous rules (that I discussed previously) and intense cultural expectations and structure to the Japanese way of life. 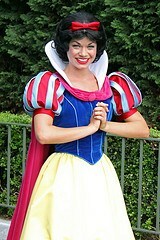 They just do not go with operating a Disney theme park. Through all its sophisticated technology, theming, and no expense spared look, DisneySea is not our favourite park - that title is still held by Disneyland Park at Disneyland Paris, and I challenge Disney to make another park that matches that.